Easy Sheet Pan Eggs for Keto Meal Prep or Breakfast Sandwiches! You seriously can’t beat sheet pan meals for easy weeknight dinners. Everything goes on one pan, fewer dishes to clean, and I get to enjoy a freshly-cooked meal for so little effort! Why not make the most of ’em at breakfast time, too? Ditch the skillet and spatula and whip up a batch of sheet pan eggs in the oven instead! 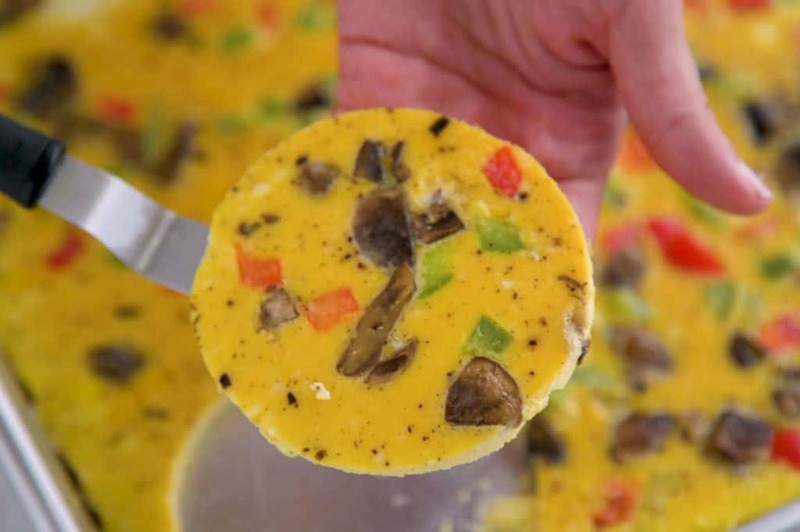 This is an awesome option if you need to cook a batch of eggs for a crowd, and you can customize your mix-ins to suit you and your family’s tastes. 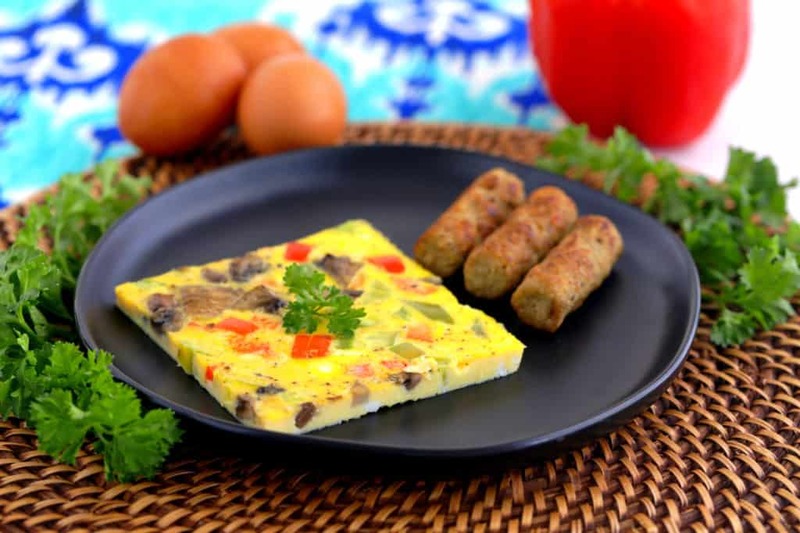 Or, if you’re looking for keto breakfast ideas, this recipe lets you prep some veggie-packed, low carb breakfast protein to last you all entire week. Best of all, it only takes about 30 minutes to prepare! Just chop your veggies of choice, stir them into your egg mixture, then pour onto your pan and bake. You don’t even have to sauté or cook your veggies at all beforehand. With loads of vegetables, 7g of protein per piece, and only 1g of net carbs, this recipe has become a keto meal prep staple for me. Personally, I usually eat 2 pieces with some breakfast sausage or bacon for a more filling and satisfying breakfast! Or, you can keep the accompaniments vegetarian since this recipe is meat-free. Or, if you’re not eating low carb, you can use these sheet pan eggs for breakfast sandwiches! Cooking Eggs in the Oven? If you’ve never baked eggs or tried cooking eggs in the oven, this recipe might seem weird. But, trust me, you’ll become a believer once you give it a try! You can actually nix the skillet and make all sorts of oven baked eggs—even fried or scrambled eggs in the oven. This is more like a low carb baked frittata recipe, and it’s unbelievably easy to make. 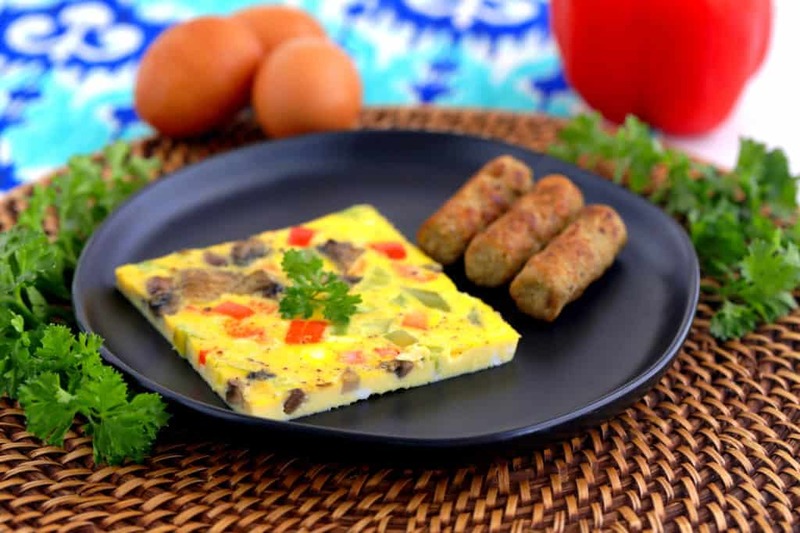 With a classic frittata, you’ve gotta sauté your veggies, pour over your egg mixture, and monitor that skillet to see when it’s ready to flip. But, with sheet pan eggs, you just mix everything together, pour it on the pan, and let the oven do the work for you! Plus, it only needs to bake for about 15 minutes, which is a miracle on busy mornings. That said, if you’re a die-hard freshly-cooked eggs kind of eater, sheet pan eggs may not be for you. But, if you’re open to eggs in their many delicious forms (like me), this is definitely a keto meal prep recipe worth trying. The real beauty of it is how little work is required relative to how much food you end up with! At first, I expected baked eggs to be rubbery and not-so-appetizing. But, when I make these sheet pan eggs as part of a keto breakfast, I’m honestly still surprised by how tasty they are! Sure, these aren’t on the same level of fluffiness as a freshly-cooked frittata or omelet. But they taste like REAL eggs—light, fluffy, and flavorful! 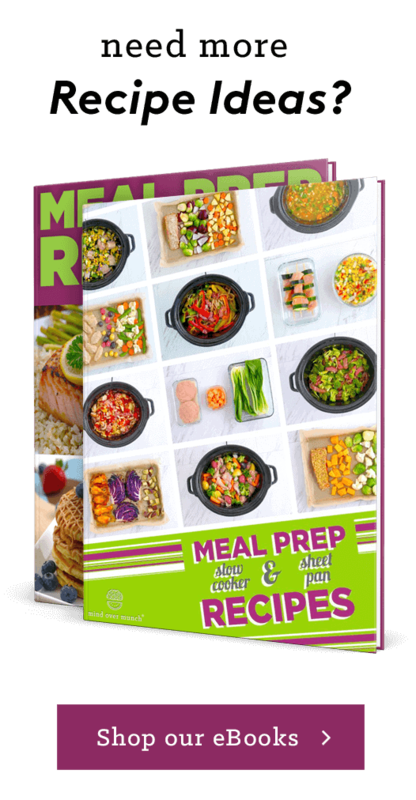 Most importantly, the ingredients are totally adjustable to suit your keto diet or meal prepping needs. You can add more eggs (up to 18 total) for more volume, and to pack in more protein and fats. And, feel free to use whichever chopped veggies that YOU like! This is totally versatile and customizable—make these as fancy or plain as you want. For meal prepping purposes, slice up your sheet pan eggs into your desired portions and let them cool completely. Then, transfer to an airtight container and they’ll last 5 days stored in the fridge. When you want to eat, just heat up however many egg patties you like in the microwave until they’re warmed through. Or, you can also store these in the FREEZER for up to 3 months! I just recommend wrapping each individual egg patty in plastic wrap before transferring to a larger container, so they don’t stick together. Then, transfer to the fridge to thaw overnight before reheating in the microwave. Of course, if you’re prepping for a family breakfast or cooking eggs for a crowd, you can totally slice and eat your sheet pan eggs immediately! You can dress up the eggs with your favorite sauces or condiments—like salsa, hot sauce, or ketchup—to add flavor and keep your mornings interesting. Then, serve with your favorite breakfast accompaniments! Try sausage or bacon for a keto breakfast option, or pair with toast, hash browns, fresh fruit, or whatever your family enjoys. 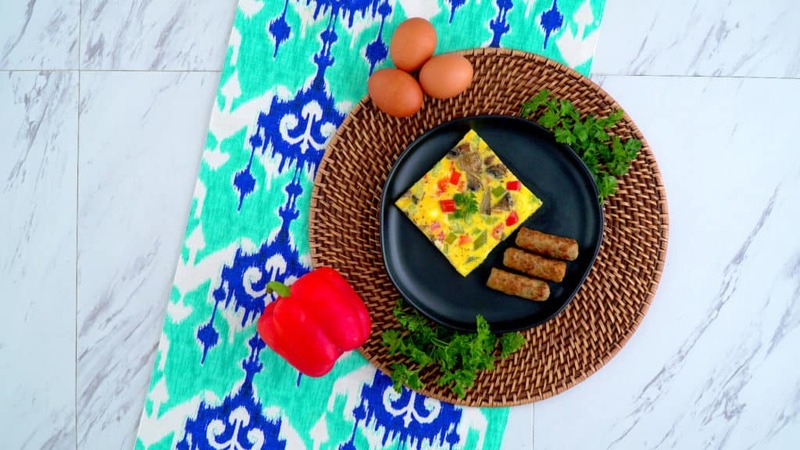 Get creative and you never have to eat the same breakfast twice! If you’re a fan of breakfast sandwiches, sheet pan eggs honestly will make your morning routine so much easier! No need to fuss with cooking your eggs into a particular shape, and you can have your egg patties prepped ahead of time so they’re ready when you want them. Plus, you sneak some extra veggies into breakfast time! For my keto meal prep purposes, I just sliced my sheet pan eggs into squares using a knife. Or, you could also use a 3-inch circular cookie cutter to get perfect egg patty shapes to stack onto English muffins or bagels! Especially if you’re prepping for a family, cooking all of those eggs in the oven saves you tons of time and effort. 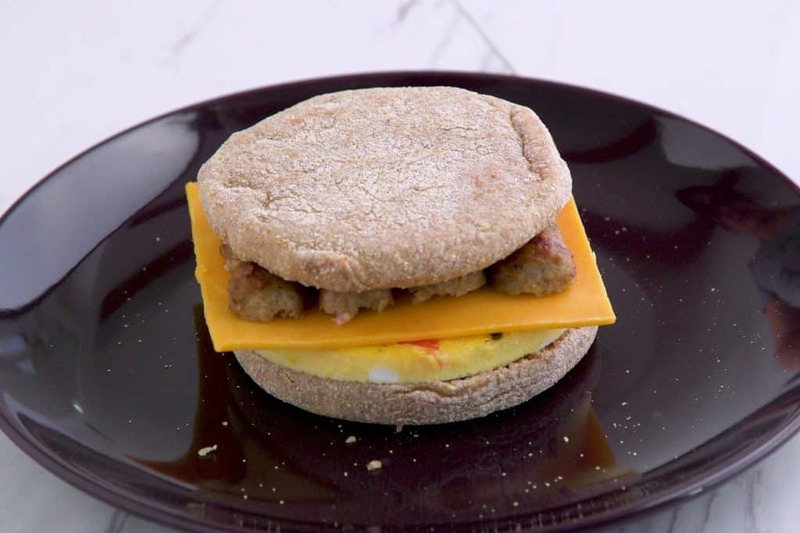 Obviously, those sandwich options wouldn’t work if you’re looking for keto breakfast ideas, but it’s a cool trick for anyone not on a low carb lifestyle. 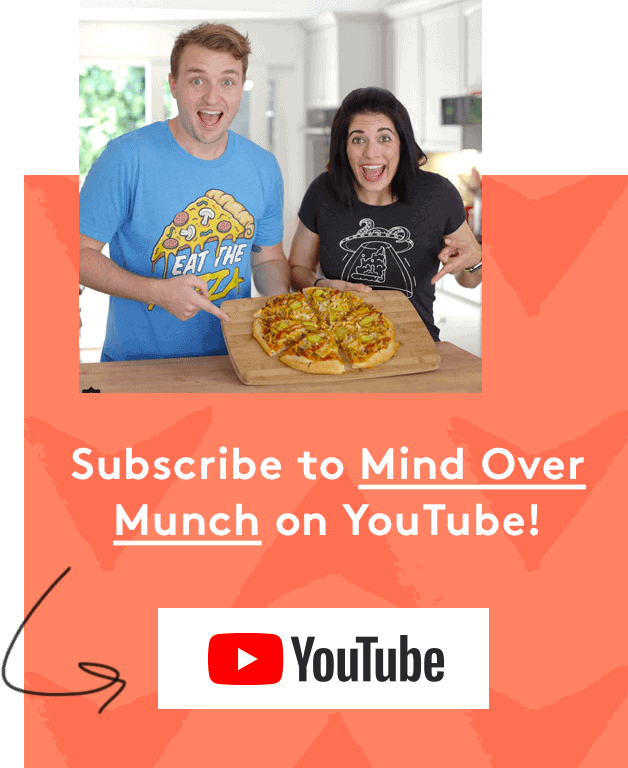 And, even if you are on a keto diet, there are plenty of low carb ‘bread’ substitutes and ‘bun’ options’ that you could try, if you were so inclined. If you’re sick of the same breakfast routine, or sick of rushing around in the mornings cooking up fresh eggs and bacon, these sheet pan eggs are worth giving a whirl! Check out my Keto 101 video and my How to Get into Ketosis Fast video! Or, for more keto breakfast ideas, you might like my sausage and egg keto breakfast casserole, or my keto pancakes! Bake 15-18 minutes, until set. Allow to cool slightly before cutting into squares and serving! Option: use a 3-inch round cookie cutter to cut your sheet pan eggs for breakfast sandwiches! They’ll be the perfect size to serve on an English muffin or bagel with your favorite toppings. Yields ~12 servings, depending on size of cut. Allow sheet pan egg patties to cool completely. Transfer to an airtight container and store in the fridge for up to 5 days. Reheat in the microwave until warmed through. Wrap each egg patty in plastic wrap before transferring to a larger airtight container. Store in the freezer for up to 3 months. *Adjust this recipe & the ingredient amounts as needed for your keto meal prep. 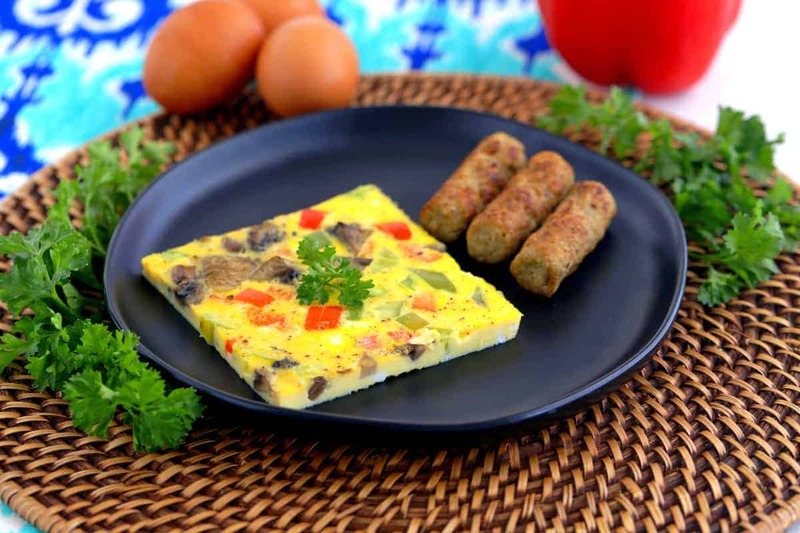 You can use up to 18 eggs or add more chopped veggies for a larger prep or more servings, if desired! **Nutrition below provided for sheet pan eggs made with 12 eggs.